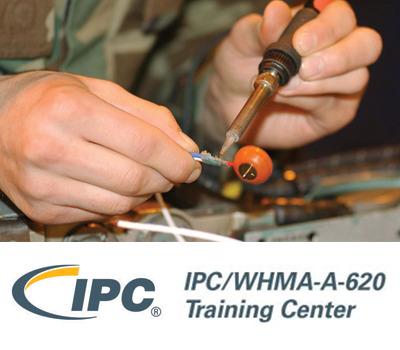 The IPC A 620 teaches cable and wire harness installation and fabrication. It presents a collection of visual, electrical and mechanical quality acceptability requirements for cable, wire and harness assemblies. The course shows students how to identify target, acceptable, and process indicators and defect conditions for class 1, 2 and 3 manufacturing. This course is designed to improve individual discrimination skills, which means to improve accuracy of discriminating between an acceptable or not acceptable cable or wire harness assembly per the IPC/WHMA-A-620 document. The objective of the course is to teach correct application of the standard, which defines acceptability criteria for crimped, mechanically secured and soldered interconnection and the corresponding lacing/restraining criteria associated with cable and harness assemblies. Individuals who have completed requirements for the IPC-A-620 CIS or CIT courses will receive a certificate remain certified for two years. Please fill out the form below and one of our administrators will be in contact to schedule your certification within 1-2 business days, or call us anytime toll free at 1-877-523-5962.